Portraits of Daniel Radcliffe and Ralph Fiennes, A3, bristol paper, graphite pencils (2H to 8B), nearly 30h. I and my generation grew up with Harry Potter, the books and then the movies. Now it's going to end, next week the last chapter will be available in cinemas. 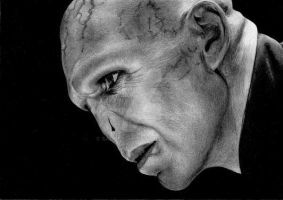 I wanted to celebrate this awesome saga with a last "portrait", and I thought this face to face between Harry and the Dark Lord would be a good picture for that. Hi, Just came across your work. Im currently looking for Artist to join my team to create original art for book covers. I love your style and think it will really work with what im after. Please have a look at my profile to find the the webpage it explains the projects and lists the books were covering. Hope to hear from you soon. You are very talented! Very beautiful drawing! Our parents were the Star Wars Generation, we are the Harry Potter Generation! this is amazing! it looks like a picture! OMG OMG OMG.... THIS CAN'T BE A DRAWING....!!!! Speechless! It looks like a photo!! Btw, do you have the WIPs for this? I would like to draw this piece, and a step by step process would be good Thanks! Thanks ! Sorry, I don't have a WIP for this one ! wow. 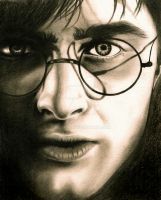 this being harry potter and amazing makes it awesome. I love it! When I showed this to my mom and she almost did not believe me when I told he it was drawn out and not a photo. All right, this piece makes me want to quit. I can't even fathom this talent. WOW. This is just amazing! Outstanding work! Are you kidding me! this look like a picture!! That's outstanding. Looks just like the poster. Okay, it's official, I love you. You and your spectacular artwork. You are the definition of professional and perfect.